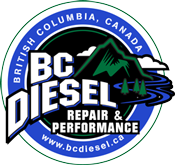 AM Diesel's high quality EGR Delete kit for 2011-2016 Ford 6.7L Powerstrokes. 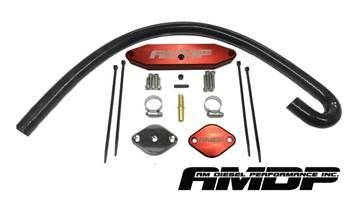 Kits are available in either red or black anodized finish for the EGR plates. Proudly made in BC, Canada! 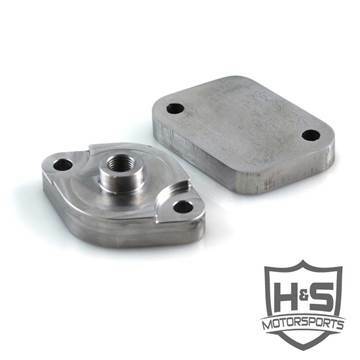 Eliminate the problematic EGR valve and cooler with this high quality, low cost delete kit for your 2011-2015 Ford 6.7L Powerstroke - Works with Factory or Aftermarket Pyrometer. Race tuning required. 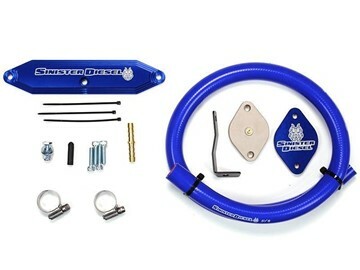 Sinister's EGR & Cooler Delete Kit for your 2011-2014 Ford 6.7L Powerstroke is designed to clean up the air in your intake, giving you faster turbo spool and lower exhaust gas temperatures. This kit requires the use of an aftermarket 1/8" pyro probe for proper operation. Sinister's EGR & Cooler Delete Kit for your 2011-2014 Ford 6.7L Powerstroke is designed to clean up the air in your intake, giving you faster turbo spool and lower exhaust gas temperatures. This kit re-uses the factory EGT probe.